A few weeks ago I welcomed home a new tree for my front yard: The Autumn Brilliance Serviceberry, or Juneberry tree. Over the past few months, I’ve painstakingly researched the possibilities and settled on this beauty. I can’t wait to tell you about it and all the suggestions I have for choosing and caring for your perfect tree! The Autumn Brilliance Serviceberry boasts 4 season interest. From flowers to berries to fiery red to beautiful bark, this tree gives you a lot of bang for the buck. The serviceberry tree blooms with white flowers in the early spring before it even has leaves on it! The blooms note one of the first signs of spring. But, the blooms quickly fade (in 1-2 weeks), and oval shaped leaves emerge coppery-red, becoming rich green throughout the growing season. In the summer, the Autumn Brilliance Serviceberry tree produces sweet purplish berries that you can eat! They kind of taste like a mix between an apple and a blueberry. But, you will have to fight the birds if you want some of the berries because they absolutely LOVE them, too! The Autumn Brilliance gets its name for the fiery show it puts on in the fall The fall color is dramatic and outstanding — fire-engine red. The bark is smooth and light gray, and looks really lovely throughout the winter when there are no leaves. This tree is available as a single stem (like mine) or if you are looking for even more winter interest there’s a multi-stemmed variety. Getting my Autumn Brilliance Serviceberry home was the very first step. 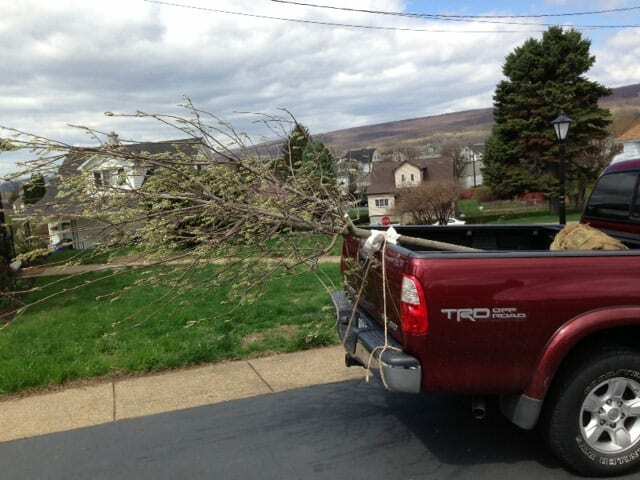 Luckily, I used a local nursery and they were able to load the tree into my neighbor Tony’s truck for us. My tree was already pretty tall — about 12 feet! I didn’t want to get a dinky little tree and have to wait 10 years for it to look half decent, especially in my front yard. So, I sprung for a larger, more established tree right off the bat. My friends at the nursery advised me to leave the tree in the burlap planting. They also recommended digging a hole that’s just shy of the height of the root ball, but 4x width of the rootball. 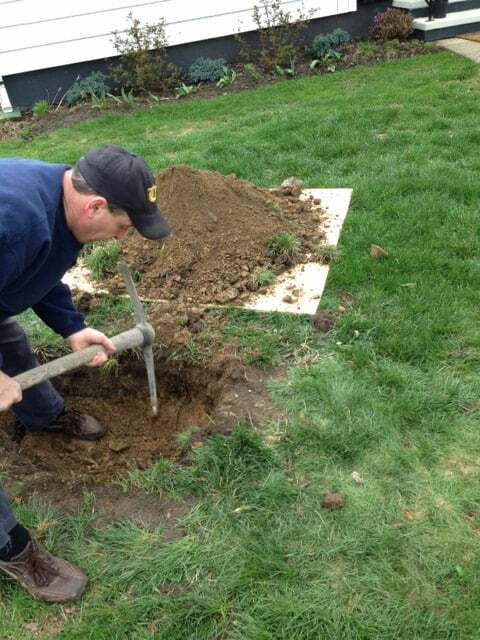 So, we ended up digging a hole about 4 feet wide and 1 foot deep to accommodate the new tree. A lot of times, people plant the tree too deep, and then it doesn’t grow, so it’s important to do some measuring and make sure you give the tree the best chance to thrive! Slowly and carefully lower the Autumn Brilliance Srrviceberry into the new hole- try not to damage the limbs or the root. I held it steady and tried to keep it level while Tony back-filled the dirt. Cover the base of the tree and surrounding area with a 3″ layer of mulch to keep the roots cool. The mulch also helps the soil to retain moisture and suppresses the growth of weeds with can compete with the tree for water and nutrients. For watering, I recommend grabbing one of these Treegators. The Treegator is a slow-release watering bag that wraps around the tree trunk. It saves time and takes a lot of the guesswork out of watering. Slow watering your plants helps them to establish strong roots, too. Here’s my tree parked in the driveway after we took it home from the nursery. Here’s my Autumn Brilliance Serviceberry right after planting. You can see it’s very tall, but not very full. Wait until you see it now! 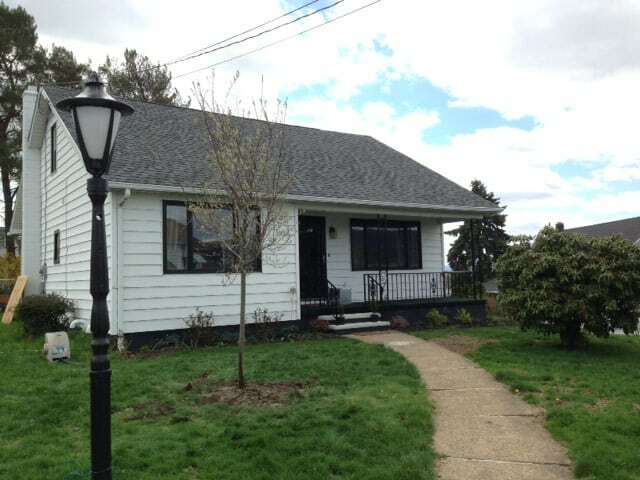 Overall the serviceberry is a fantastic tree and the pros heavily outweigh the cons. You should be aware that this tree is prone to suckers (since its technically a shrub trained to a single stemmed tree). Root suckers are vigorous vertical stems that can grow off the tree’s root system. 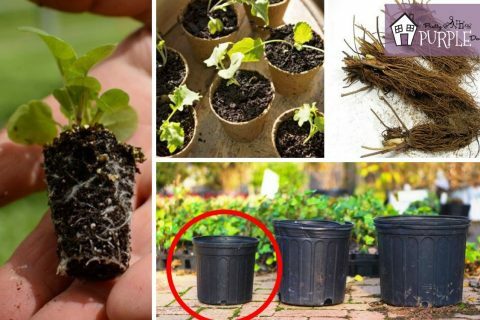 If you’ve never come across root suckers before, you may want to watch this video about how to remove root suckers. I personally don’t have a problem with them. To me, the pros of this tree far outweigh the hour or so I spend caring for it each year. But, I wanted to mention it in case its a concern for you. There honestly aren’t many cons to planting this tree. It’s really disease resistant, has non-invasive roots, a compact size and isn’t used as often as it should be… making it a unique tree to add to your landscape! But, it you’re still undecided about the Autumn Brilliance Serviceberry, check out some of my favorite ornamental trees for front yards. I’m sure you’ll find something that you like! I get many questions about the growth of the tree, so here are some photos I’ve taken over time! Please let me know if you have any questions. 10/30/15 – a photo of the leaves against the sky. Overall I’m really happy with my decision to put the Autumn Brilliance Serviceberry tree in my front yard. It’s grown each year and the color and four season interest does not disappoint. In early spring, enjoy the beautiful white blooms of your serviceberry tree before the leaves even appear. Then, in June enjoy the edible berries if you can fend off the birds who absolutely love them, too. This tree will not disappoint with its fiery fall foliage and certainly makes a statement with its unusual bark color and beautiful growing habit. 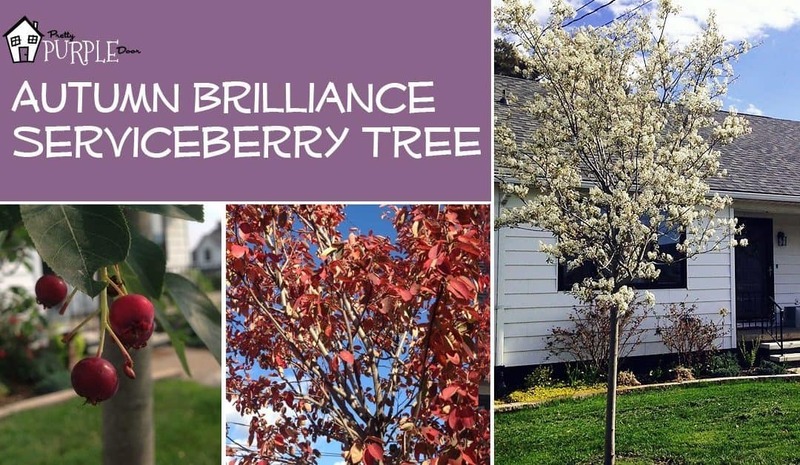 Overall, the Autumn Brilliance Serviceberry tree is a true standout in the garden and one of my top picks for ornamental trees for your front yard. 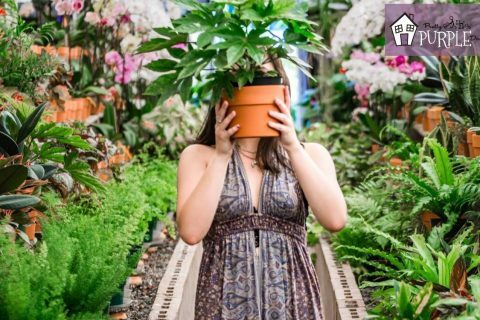 Budget garden tips to get cheap plants and more bang-for-your-buck on plants you already have. Create a budget garden of your dreams without breaking the bank. Simple ways to extend flower bloom time and frequency. With a few tricks you’ll have perennial flower blooms that look amazing and last all season long. Create beautiful landscaping on a budget with these budget-friendly tips for front and backyard landscaping that won’t break the bank. Never know what to plant together? 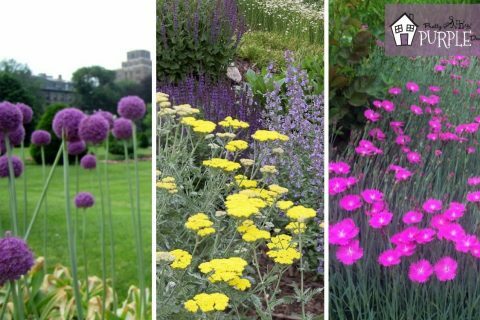 Find out with this FREE Plant Pairing Guide and become a pro at combining plants for the best garden design possible! Hey, since you're already signed up for my emails, you may be interested in my Printable Garden Planner Kit. It includes 5 printable worksheets that you can use to plan and organize your landscape. Check it out here. For your convenience, this post may contain affiliate links to supplies, tools or specific products I'm writing about. There is no cost to you for using these links and they may provide me with a small commission so I can continue this blog (thanks for your support). Please visit my site policies for more information. Thanks for all the information. I’m trying to figure out when to plant it. It’s a little over a foot tall, bare root, and in the past week has grown a few leaves at the top. I live in zone 5A and we still have some patchy snow on the ground. Can I plant it yet? Thanks for the help! Hi Jacalyn, no don’t plant it yet if you are in 5A. Wait until temperatures are above freezing, especially overnight. My mom always said it’s best to wait until after memorial day! But, if the temps get a bit warmer and you don’t think it will dip below freezing anymore, that’s when you can go for it. Then afterwards if there’s a chance of frost just make sure you cover the tree overnight. Thanks so much for this post with pictures! Very helpful! Yes you can eat the berries! To me they taste like a mix between a blueberry and an apple if that makes sense 🙂 I’m sure they make delicious jelly! Hello! I also came across this post while searching about the tree. I noticed that it does produce berries, and I wandered if the birds eat them before the fall and make a mess everywhere? still waiting for those photos . . .
Amy, thank you for your reply! That’s just as I expected — it’s a small tree anyway. Love its four-seasonness, and I think it’s going to be one of the trees in our yard 🙂 Thanks again! This article was very informative. Thank you. My city is selling some select types of trees, and this serviceberry is one of them. I wandered upon your post upon my research. You’ve convinced me to get the tree! By the way, did you know you can eat the berries? Hi – I like your post. I’m wondering if you have any pics of your tree now? I’m wondering how much it grew in one year and whether you’ve had many blooms yet this spring. thanks! Garden Styles: What type is right for you?